This package is offered in partnership with Travelzoo. Aspire Down Under offers travelers unique experiences in each location. Our philosophy is to engage visitors in the culture of Australia, and allow them to see the country through the eyes of a local. Experience Melbourne's beautiful parks and gardens, mixed with fine Victorian architecture, elegant tree lined boulevards, modern skyscrapers and diverse shopping and cuisine make for an unforgettable stay. Outside Melbourne, you'll visit a host of regional attractions, from the little penguins on Phillip Island, the spectacular Great Ocean Road and the wining growing Yarra Valley. These small group tours offer outstanding value. 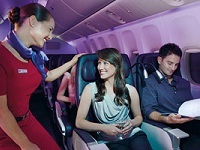 Depart Los Angeles on award winning Virgin Australia to Melbourne. Our price includes options in Economy, but please speak with an Artisan specialist in you are interested in upgrading to Premium Economy or Business class. On arrival into Melbourne you will be transferred by Seat in coach transfer to The Blackman Hotel, where you will stay for six nights in a Studio Suite Balcony. This boutique hotel offers modern luxury suites, each with designer furnishings and private balcony. All suites at The Blackman showcase the works of the celebrated artist Charles Blackman. The state-of-the-art fitness center includes cross-training equipment, yoga mats and free bottled water. The Blackman Melbourne also offers bike rental to see nearby Abert Park. Fleur Depot De Pain offers classic French meals and delicious brunch options. Classico Restaurant serves traditional Italian cuisine in a stylish atmosphere. There is tram stop right outside The Blackman and the center of Melbourne is only one mile away. It is a 10-minute walk to the Royal Botanical Gardens. Our exclusive offer – Stay for 6 nights and pay for 4 nights! Get two nights FREE night. This morning join your Hidden Secrets tour at the Time Out Café at Federation Square (café opposite Flinders Street Station), to commence a half day Lanes and Arcades Tour. Indulge with a casual walk through Melbourne's lanes and arcades in small groups to engage in the life of this city which many miss. Discover local designers and specialty retailers, tiny cafés and more. A little history and attention to amazing architecture will inspire locals and visitors alike. Lunch is included. Get orientated and return to those places you like best in the afternoon, at your leisure. Tour concludes at approximately 2.00pm, at Caboose Restaurant. At conclusion of tour make your way to Skydeck 88, one of Australia's newest must-see attractions. Located next to the Yarra River, the building's two elevators propel visitors to the 88th floor in less than 40 seconds. Once at the top, you're at the "Edge Experience"—a switchable glass cube that slides out from the building with you inside! The cube walls and floor of the Edge start off fully opaque and change to clear once the cube is fully extended. The breathtaking effect is accompanied by a dramatic soundtrack which varies with each experience. Moving at a speed of 3 feet (1 m) per second, the cube moves in 5-minute sequences until extended to its full distance high above Melbourne. Late morning depart Melbourne on your small group tour for Phillip Island. Get up close and personal with the friendly residents of Moonlit Sanctuary Wildlife Conservation Park, hand-feed kangaroos and wallabies, have your photo taken with a koala (small fee applies) and learn about the conservation of these amazing animals. This Eco-certified sanctuary showcases the famous and endangered faces of Australia’s wildlife, including the southern bettong, eastern quolls and rare fluffy gliders. From here we travel to historic Churchill Island, where you will see sheep shearing and working dogs in action. On Phillip Island we visit the stunning Cape Woolamai surf beach, see the Nobbies and Seal Rocks before arriving at the Penguin Parade where you will view the penguins from the "Penguins Plus" viewing platform; Home to Victoria’s largest colony of little penguins, Summerland Beach provides the backdrop to the world famous Penguin Parade. Watch as hundreds of little penguins make their way across the beach and return to their sand dune burrows. Depart Melbourne on your small group tour to commence a full day tour to the Yarra Valley. Transfer to Yering Station vineyards and start the day by being shown how to swirl, sniff and slurp, then you’ll be ready to taste some of Yering Station’s award winning classic Australian wines. Travel to Balgownie Estate, one of the most stylish venues in the Yarra Valley with wines to match, and enjoy lunch with a glass of Balgownie Estate wine to compliment your meal. After lunch travel to Yering Farm Vineyards. Experience wines made with traditional wine making methods in their cellar door which showcases antique copper wine making tools used by pioneer winemakers over a century ago. A fantastic environment to enjoy superb wines. Next visit is French Champagne company Moet & Chandon's Australian production house - Domaine Chandon, the perfect way to finish the day with a guided tour through the winery which shows how the wine is made, followed by a relaxing glass of Australia's best bubbly with tasty light platters and a view that will leave you in awe. Relax or self explore. Or discuss with an Artisan specialist additional tour ideas. Economy cabins on all long haul flights contain luxury leather seats 18.5 inches in width, with a pitch of 32 inches. Long haul flights also include all meals and beverages as well as individual entertainment systems for all passengers. Short haul flights offer a seat pitch of around 31 inches and a width of at least 17 inches. Personal entertainment units are available for hire on short haul flights, while meals and drinks are either included or available for purchase depending on the type of fare purchased. Premium Economy seats on long haul flights are 19.5 inches wide and have a pitch of 38 inches. Short haul seats are at least 18 inches wide with a pitch of up to 38 inches. All Premium Economy passengers enjoy their own personal entertainment units, and all meals and drinks are included. Premium Economy passengers may also access the lounges of Virgin Australia and its partner airlines. Eating in Business Class is luxurious and spacious, with a generous 77 inch pitch on long haul seats, which convert into fully horizontal flat beds. Seats on short haul flights are also spacious but have a pitch of 38 inches and do not fully recline. Passengers have unlimited access to the Luke Mangan designed menu and premium Australian wines, as well as personal seat-back entertainment. Other benefits include priority check-in, lounge access and extra baggage allowance. - Add-on fares are available from other cities. Seats are limited and may not be available on every flight. - Hotels are subject to availability. - All prices reflect a 3% discount for purchases made by cash/wire transfer/check, please see terms and conditions for credit card payment. - There are no discounts for payment made by credit cards. - Cancellation penalties and other restrictions apply.